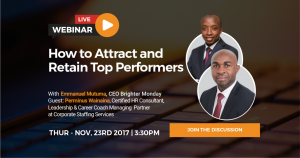 This past week, I was honored to host a webinar session around this topic together with Brighter Monday CEO – Emmanuel Mutuma. Over the years Corporate Staffing Services (C.S.S.) and Brighter Monday (B.M.) have partnered in a number of initiatives targeted towards meeting the needs of professionals and employers. The Webinar forum was an opportunity for the two entities to come together and reach our target market by delivering relevant and impactful information. In an informative 40 minutes live-cast via the internet, we tackled questions ranging from employee engagement, how to attract and retain your top performers, common questions from recruiters among others. It was rather interesting to hear Emmanuel’s perspective which was not very different to mine when it comes to how employers can attract and retain top performers. 1. What keeps employees engaged? Emmanuel and I agreed that in retaining your employees, always consider a salary increment. This not only boosts the moral of employees but also motivates them to remain loyal. Employees will always ask questions like, “am I being paid my worth?”However, it salary not be the only motivation. Rewards and compensation are equally important. Job security also motivates employees to stay in an organization. They want to be sure that they will have their job the next morning they show up for work. You communicate employee job security by providing a healthy working environment and offer avenues for career growth. Your mission and vision statement also needs to be very clear. 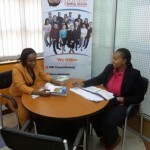 Additionally, offer trainings to sharpen employee skills and increase on their service delivery. Emmanuel and I concurred that as leaders we were agenda-setters and offered mentorship. It is a leader who sets the tone of the organization. If you have poor leadership skills, you will end up raising a breed of employees who do not value systems, structures or authority. Simple yet avoidable mistakes from leaders make employees lose trust. Apparently employers can’t seem to understand millennials! The best way to go about this is to tap into their energy and potential as opposed to fighting it. Allow for feedback systems that actually work considering this is a generation that has been exposed to a variety of technology, skills and networks. The secret is in the job description! As an employer, you want to tailor your job description. This will majorly attract candidates’ who match what you want. Also ensure that you avoid being too technical with job adverts. Thirdly, makes sure your job advert stands out or has optimum visibility. This will reach more job seekers considering the number of employers probably outsourcing for the same job. As an employer, you have to be intentional with your Human Resource. Put in place actions and plans that will motivate your staff to not only perform but stay. See you on the next Webinar forum! wow! incredible. Deep insight there.